Why, that’s a pretty artsy title I got myself right there, isn’t it. 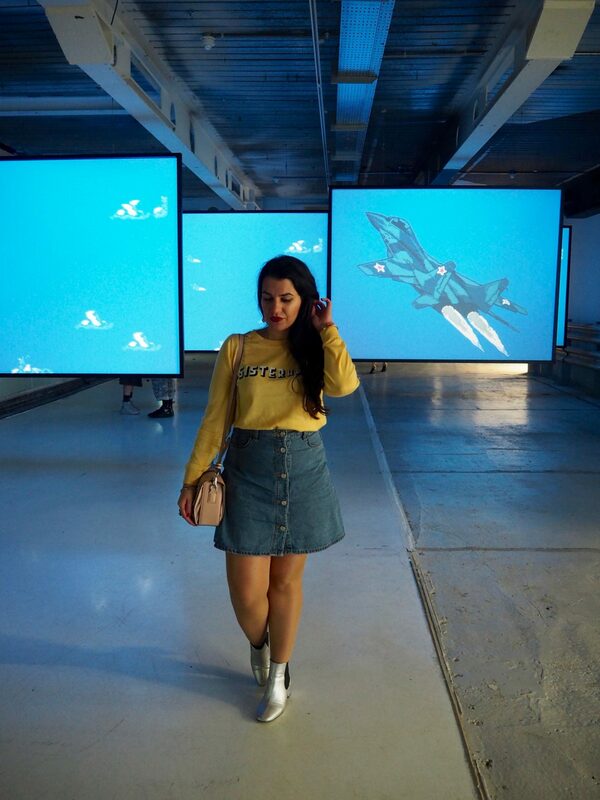 But I can’t take any credit for it I’m afraid, since “Everything At Once” is an exhibition that the bf and I literally explored last month in Store Studios (or simply ‘The Store’). 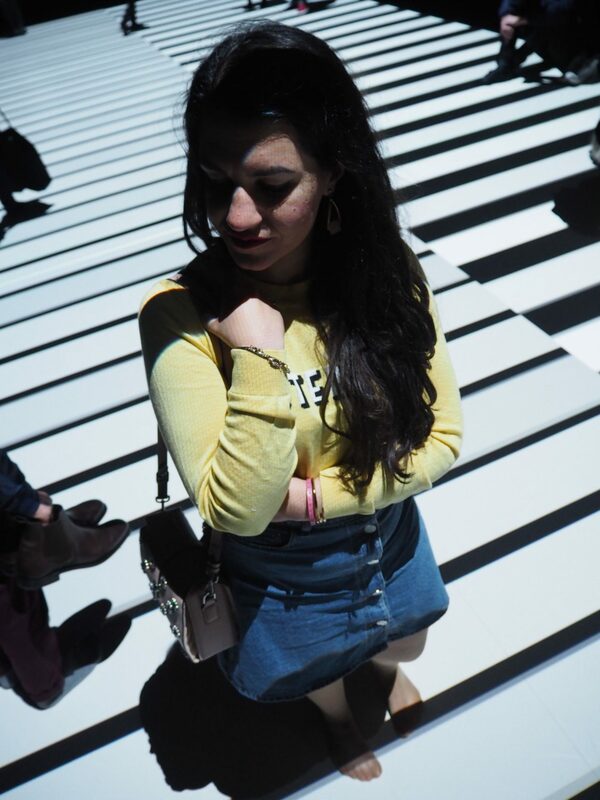 I wasn’t planning to write about it, as it was my boyfriend who really wanted to go to this exhibition encasing lots, lots and lots of modern art. 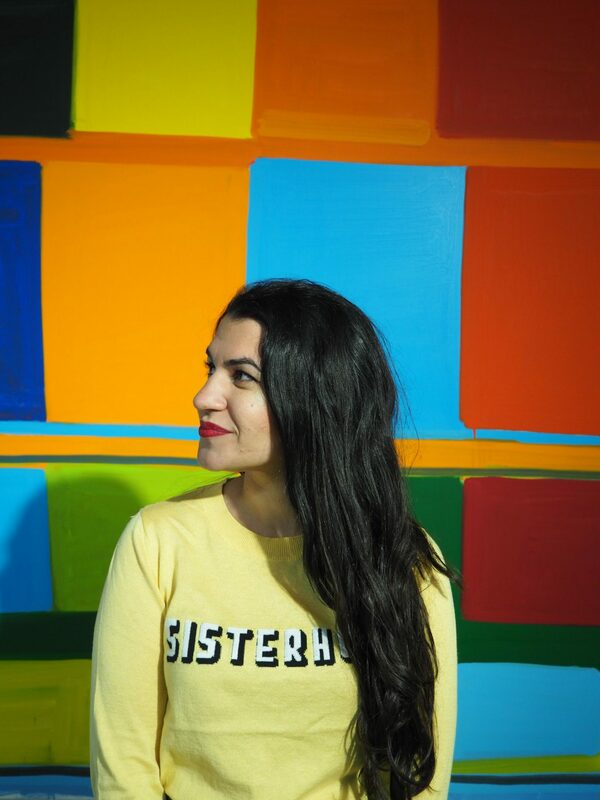 And I hate to sound like a broken record, but as I’ve mentioned many a time on this blog me and modern art don’t always see eye to eye (I’m more of a Tate Britain rather than Tate Modern kind of gal). I find a lot of it is just so uninteresting and gimmicky, intending to shock or simply waste my time. But, having had my little rant, I actually found “Everything At Once” fairly interesting and would even recommend it to friends. The exhibition starts off in full force, with the public having to take off their shoes and walk into a large room with a crazy floor. 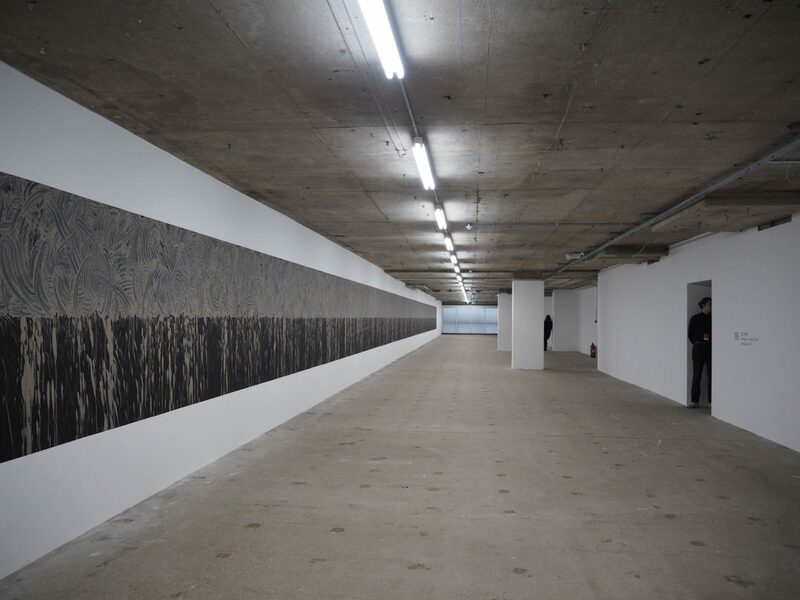 Created by Ryoji Ikeda and titled Test Pattern Nº12, this installation consists of a large floorspace covered in straight, black and white flashing lights (or lines) that are constantly changing in tune with some rather uncomfortable sounds. I suppose it’s interesting to witness (and very hard to get a decent picture of, as you can see above), but it really just made me want to go clubbing. You can get a glimpse (and a better explanation) of it here. 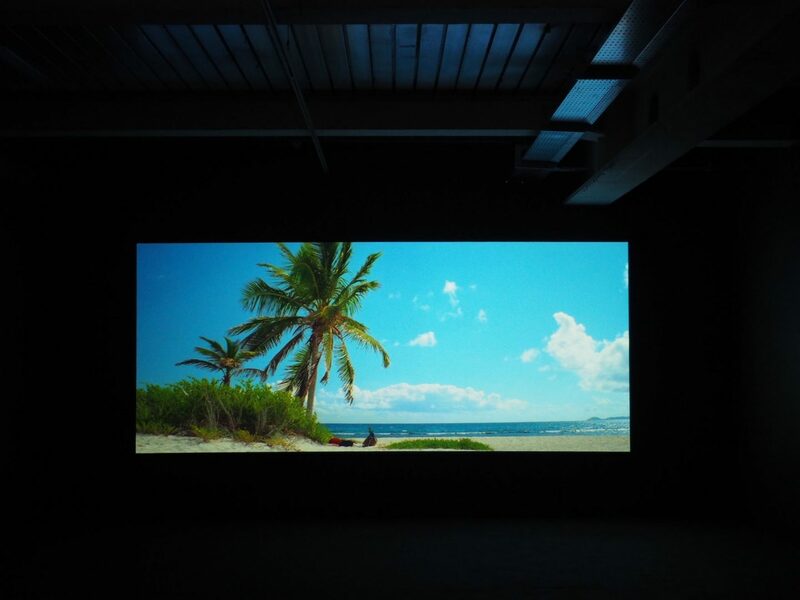 Vexation Island (above) is a 9-minute-long film by Canadian artist Rodney Graham – in all honesty I didn’t find this Robinson Crusoe-inspired, supposedly comical ‘story’ interesting or funny in the slightest, other than, surprise surprise, it was made before (and really reminded me of) that Tom Hanks movie called Cast Away. Because what’s interesting about watching a guy stranded on a beach getting hit by a coconut? 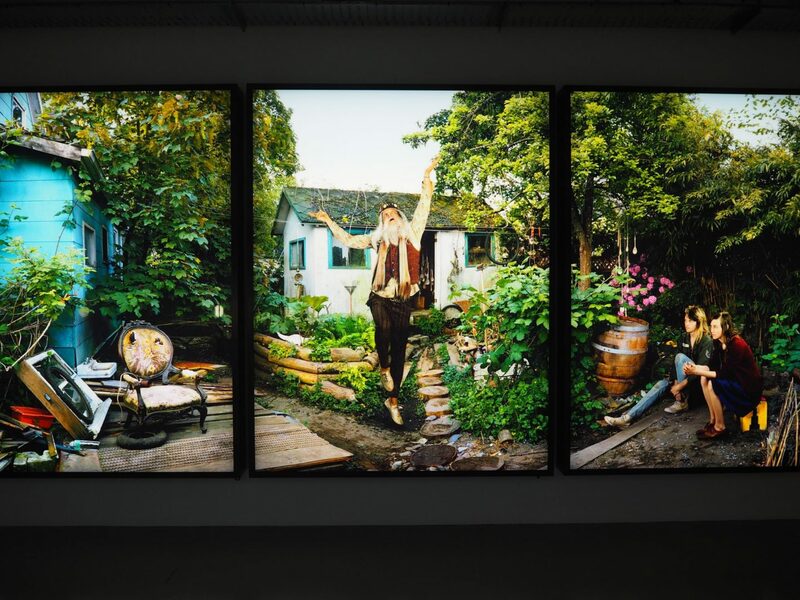 However, as I love photography I loved the box light triptych (second picture) called Leaping Hermit, also created by Rodney Graham – it’s fun, easy to look at and has a lot of movement and energy. 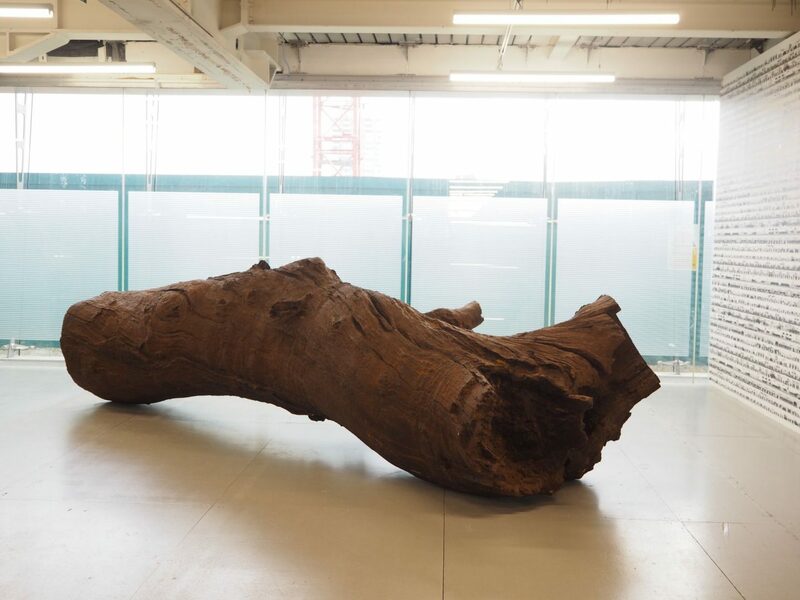 The gigantic tree trunk (Iron Tree Trunk) and striking wallpaper (Odyssey) are both by Chinese artist Ai Weiwei. 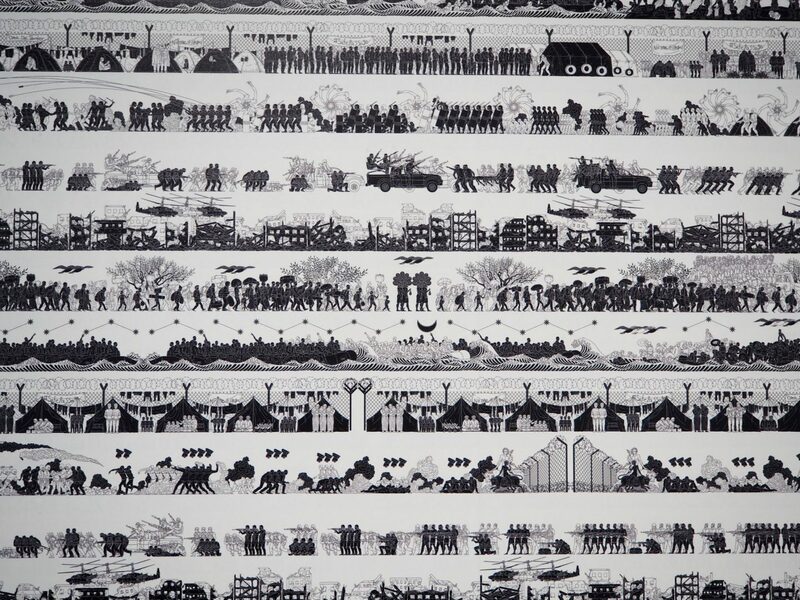 I’ve not got much to say about a tree trunk in a gallery (it’s a “Been there, done that” situation), but I loved the 60 metre-long wall covered in black and white figures and hinting at a strong and politically charged narrative. 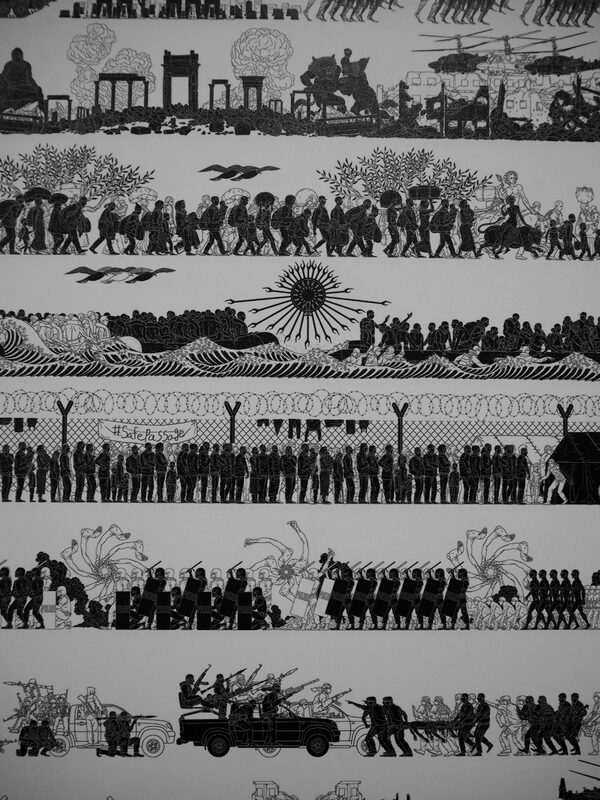 Weiwei took inspiration from classical Greek pottery and Egyptian art – two artistic eras that I love. I mean, do I love this art work? It certainly makes for a great background and is pretty cool to walk around. 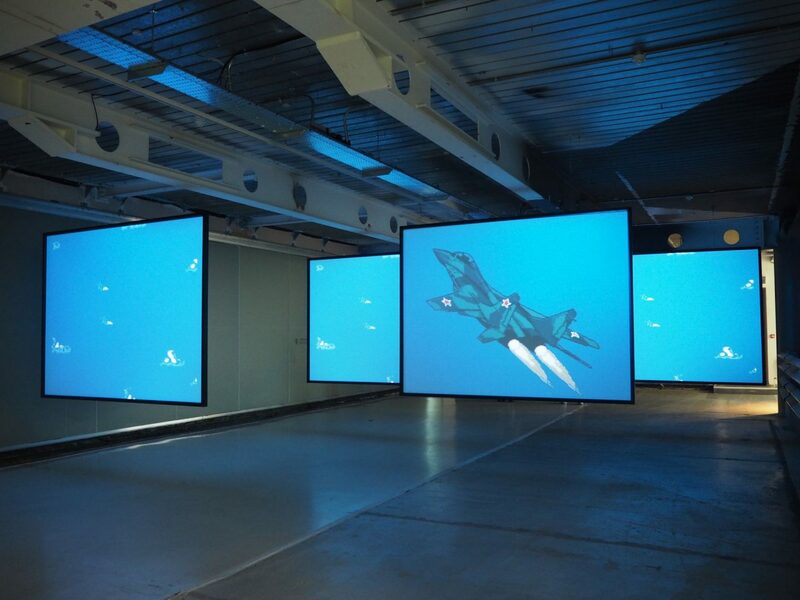 MIG 29 Soviet Fighter Plane and Clouds is by Cory Arcangel – these four projections are stills taken from a 90’s hacked video game. 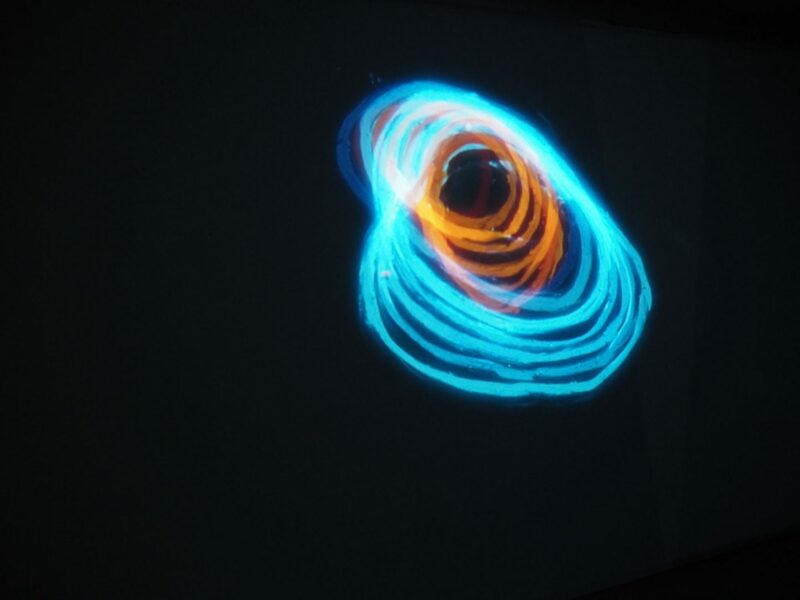 These images are from a series of screens created by Nathalie Djurberg and Hans Berg, called The Black Pot. Featuring abstract motions that change colour and bounce up and down on the large screens, I think this piece is about the beginning of life. Sometimes I love abstract art, and I loved this painting by Richard Long, called Peloponnese Line. What helped me love it was the presentation of it – doesn’t the venue suit this rugged painting perfectly? 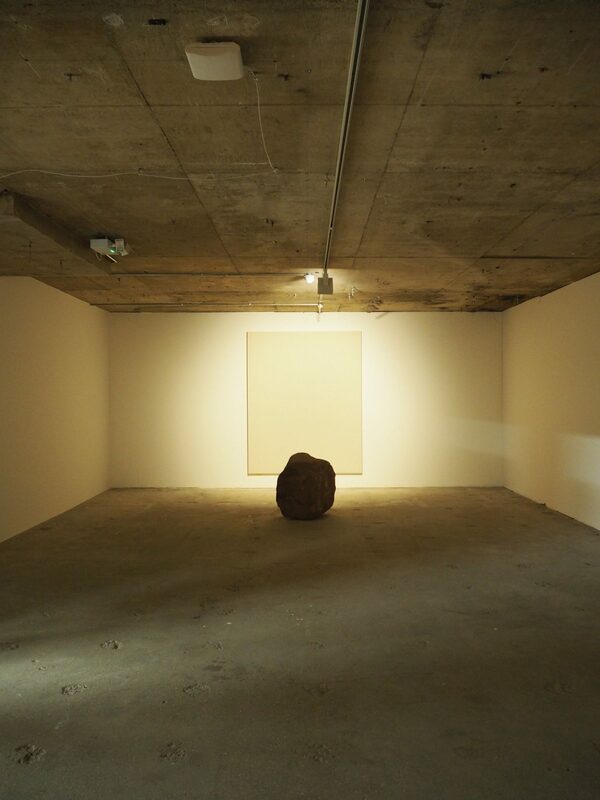 And this is an example of when abstract art doesn’t quite do it for me – this piece is by Lee Ufan and it’s not ‘enough’ for me, because at the end of the day it’s just a rock in front of a blank canvas. Having said that, the setting does draw the spectator in and I love the name of the piece, Dialogue – Silence. 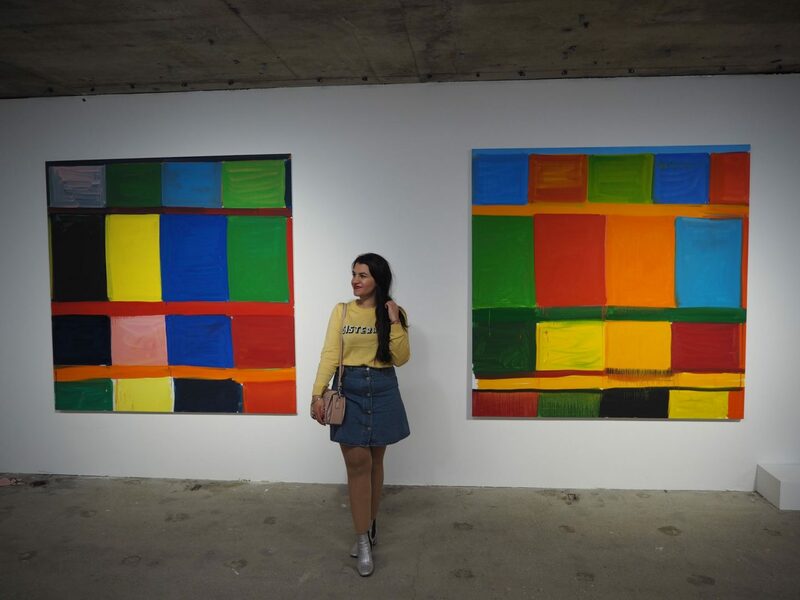 This is yet another example of when I love abstract art – is there any need to get philosophical about these paintings? 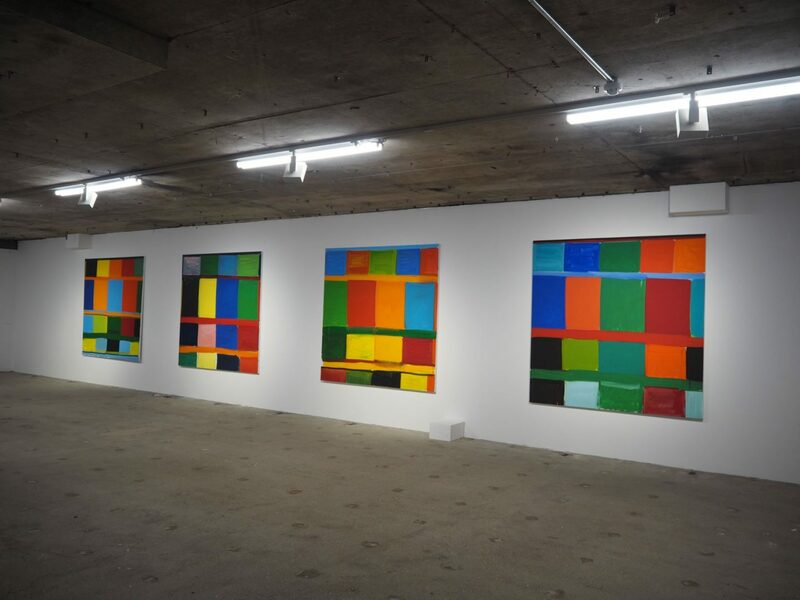 Maybe the artist, Stanley Whitney, would like us to do so – but look at all those beautiful colours! Call me basic but I love witnessing a concoction of colours all jammed up together, and I don’t feel the need to overthink it. I also happen to love the titles of these pieces – from left to right, they’re called highsummer, Prussian Blue, May Day and Bertacca. 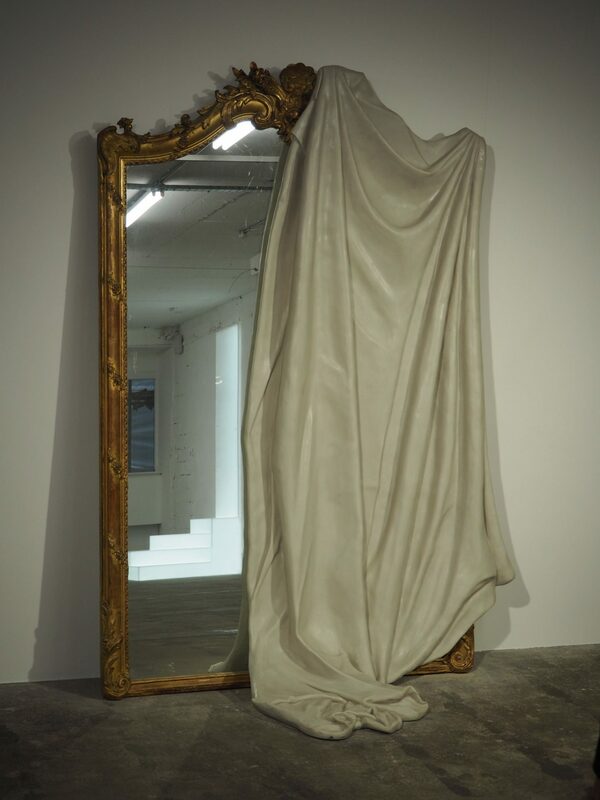 Opposite the magical stairs was this beautiful mirror with a covered sheet, which I think was called You ruin everything you adore. It’s so simple and I’m usually very critical about found objects as art, but there’s just something about this setting that’s very poetic and evocative. 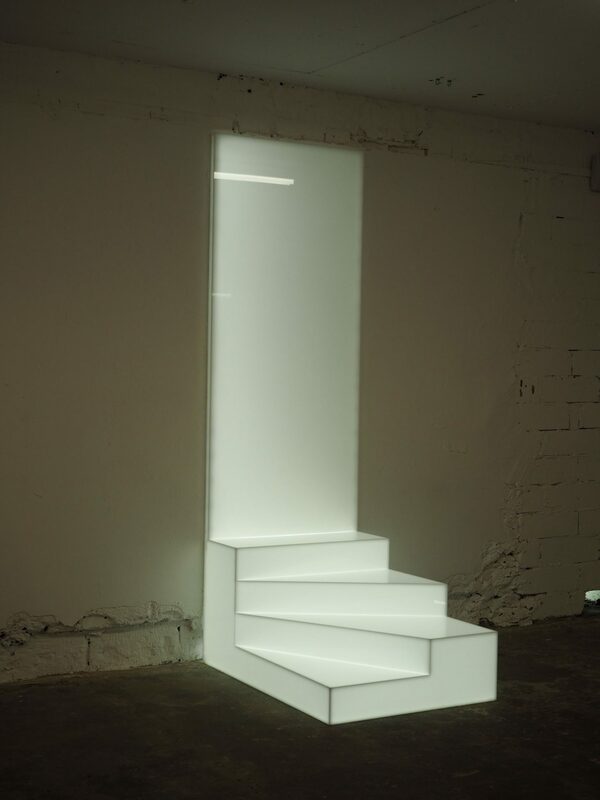 I think both the stairs and the mirrors are by the same artist, Ryan Gander. 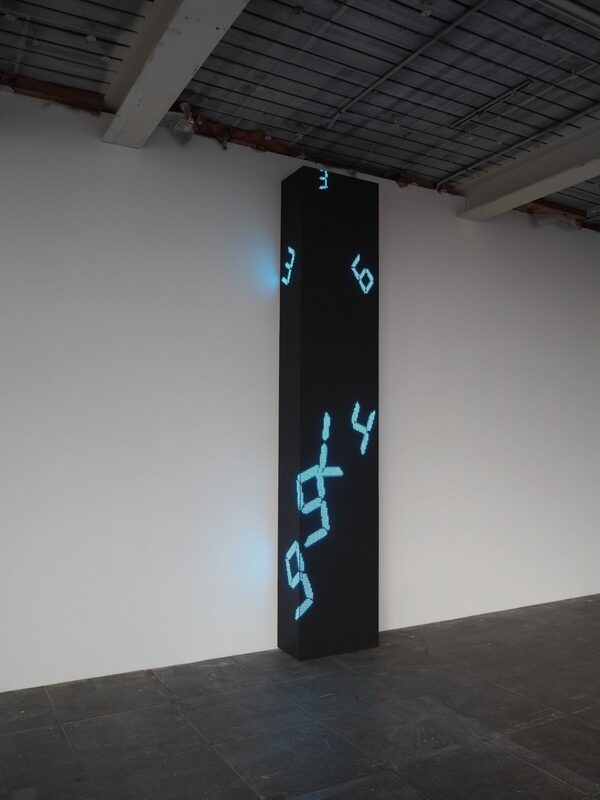 I liked watching the numbers falling on this piece by Tatsuo Miyajima, aptly called Time Waterfall. They’re meant to represent the journey from life to death. 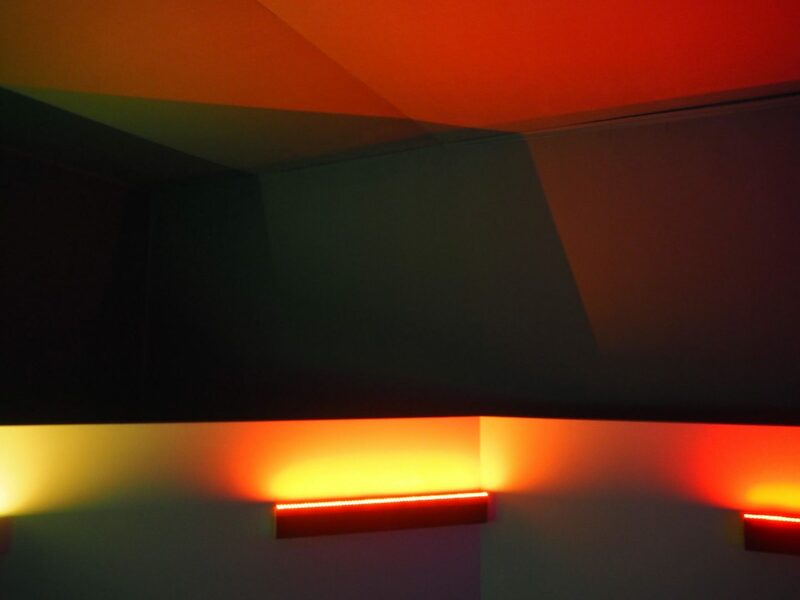 I also loved this interactive-ish piece by Haroon Mirza, it was sort of like being in a giant disco video game. Colourful, acoustic, fast-paced and interchanging, I think the full title is A Chamber for Horowitz, Sonakinatography Transcriptions in Surround Sound. 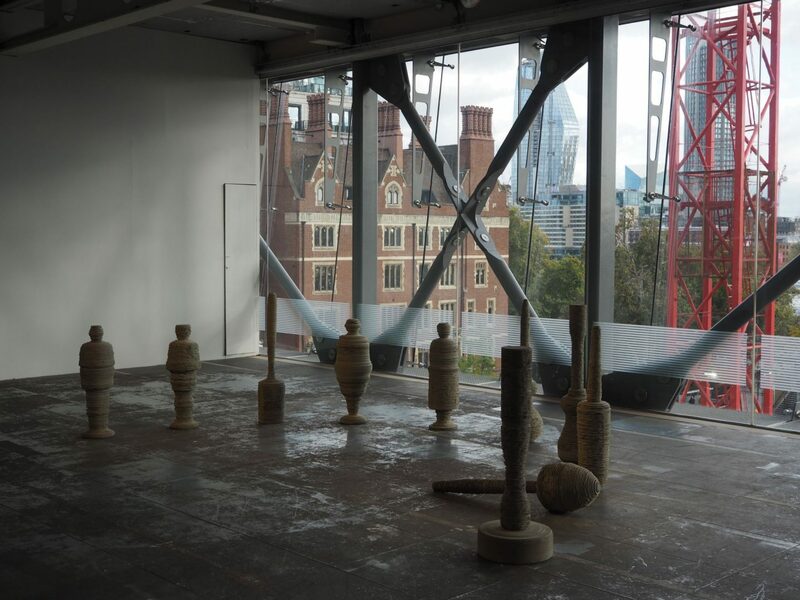 The two pieces photographed above, called Tools and Minster, are by the same artist, Tony Cragg. 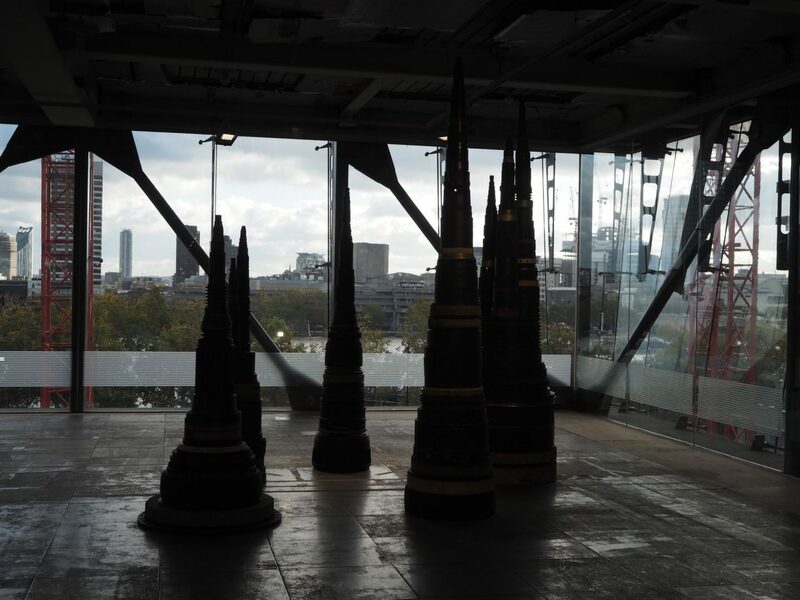 I can’t say I love them but again sometimes the setting really makes all the difference – these sculptural objects looked great with those stunning London views as a backdrop. 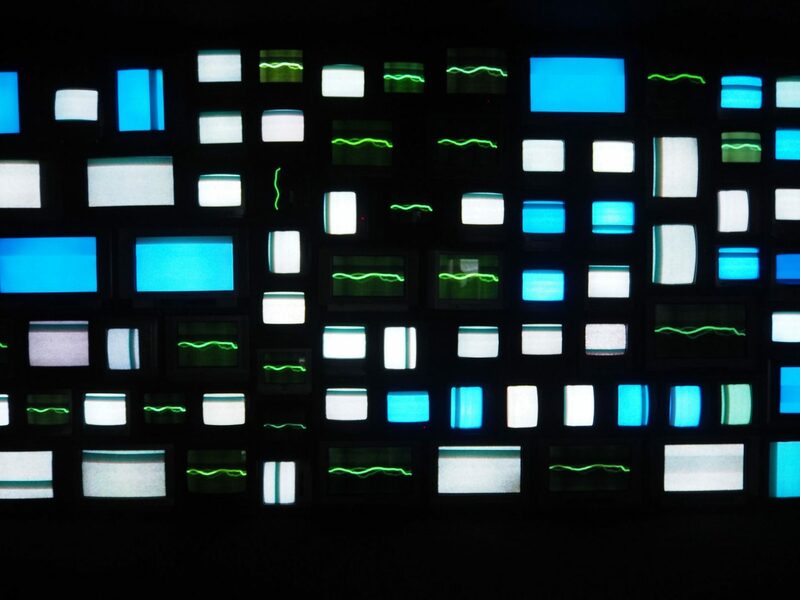 Channels, by Susan Hiller, is one of those pieces that you really need to research beforehand or actually read the caption that is next to the artwork. There were a total of 104 television screens all mounted on top of each other in a dark room with on-going voices speaking in different languages – it turns out all those voices were recordings of people who have experienced near-death experiences. This is just a portion of the art showcased in this exhibition. I didn’t even manage to get a picture of my favourite piece of all – Love Is The Message, The Message Is Death by Arthur Jafa. This 7-minute-long film, soundtracked by Kanye West’s “Ultralight Beam” is a mishmash of representations of African American identity in the media over the past few decades. It was funny, it was sad, it was deeply moving. I felt like I could have watched it over and over again. Yes, the choice of song totally helped, but I wouldn’t say that’s what made it, what made it was the choice of footage – it felt spontaneous yet worked together perfectly. I wish I could find an online link to it because it’s that good – I’d even go as far to say that it makes the whole exhibition worth it. So, if you’re in London, you have until the 10th of December to see Everything At Once. 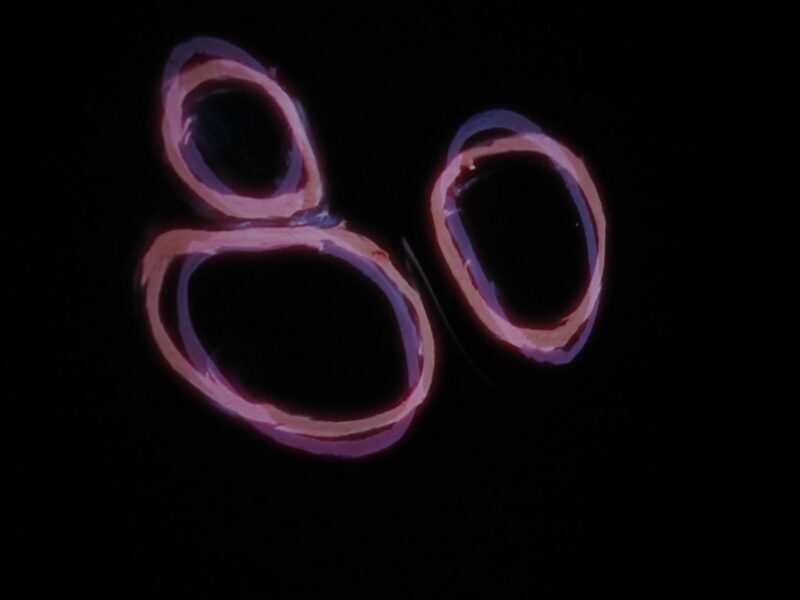 In fact, Jafa and Ikeda’s pieces will be on show for an extra four days because they’ve been so popular. Also, look out for the gorgeous cafe at Store Studios – it’s as fascinating as the exhibition itself. Pictures taken on November 5th, 2017 at Store Studios. For more information 0n ‘Everything At Once’, you can have a look here, here and here.